Greenbriar Picture Shows: Sunset For The West? 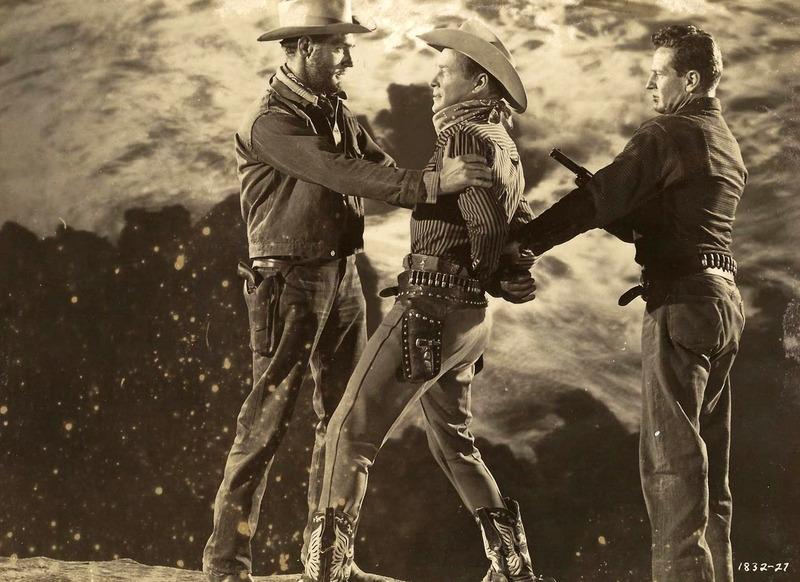 Like buffalo vanished off the plains, so goes caring for categories of film once popular. Series westerns, "B" westerns sound pejorative, and serials have long been considered preserve of old men who knew less than us what was good. There's no snobs like those born after the war. Ones who will sit through everything John Ford directed will not suffer a Tom Mix, and yet Ford worked with Mix and was probably influenced by him. What we're hearing in 2017 is death rattle of the small western. Swap meets where survivors of a matinee era gather are themselves going. Williamsburg breathed its last this Spring, and Winston-Salem's Western Film Fair will drop the curtain in July. That one dates back to the 70's in Charlotte, from which it moved upstate some ten years back. North Carolina had elsewhere conclaves, like in Siler City where Milo Holt hosted. 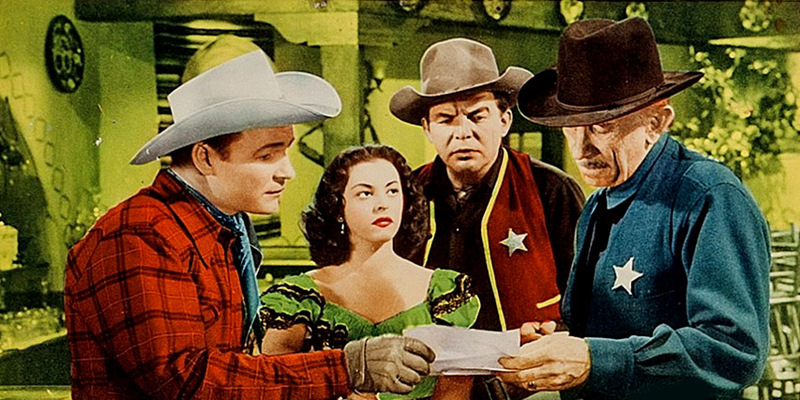 I just got the latest catalog from Sinister Cinema, prime source of westerns on DVD, in which owner-operator Greg Luce laments "the increasing loss of our customer base, sadly, due to death," this "especially evident with our B-western customers, whose numbers have drastically fallen." I'd not miss Winston-Salem for anything this year, to survey that dealer's room with what's left of Republic lobby cards and cowboy gimcracks, plus small spaces where Hoot, Ken, and the rest still ride in 16mm. "Last of a dying breed" as Rex Allen Jr. once sang, and on a film gauge already dead. Whatever tears I have for the passing of a great fan culture and its idols will be shed there. 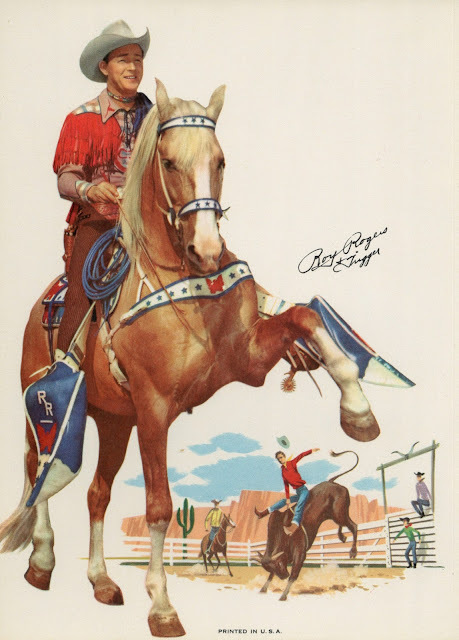 "But we're still riding high ..." went Roy Rogers' guest vocal to "Last Of The Silver Screen Cowboys," that recorded by Rex Jr. in 1982 when we were hard-pressed to see Roy in anything past chopped versions of his western output, let alone in Trucolor as applied to nineteen of them. Only a handful exist now (never mind shadowy B/W prints), a horror of a cultural loss, though a lovely exception is just out on Blu-Ray, Sunset In The West. I'd call it "Sunrise In The West" for current viewing purpose, colors lit as if Renaissance painters came three centuries later to direct for Republic. It matters not a tick if this ranks below best of Roy, just having him and Trigger and trains and chase stuff in cloudburst like this is balm to senses dulled by years of westerns indifferently reproduced. Did Sunset In The West look so splendid in 1950? If so, the Rogers religion makes plentiful sense, and I'm talking among his fans, not Roy's own observance of Faith. Sure there are hiccups, even beyond ones belabored by sidekick Gordon Jones, his running gag pressed to point where I despaired for serious medical condition he might have (unstoppable hiccups can and do kill, they tell me). Are all western tropes here and duly played out? Do pigs oink? Imagine not having them and how much less fun Sunset In The West would be. To picture it as mere kid cliché is to risk loss of stuff at times emotionally powerful. I'm talking key character Sherlock the dog, pivotal to solving the mystery (hence his name), but wounded by a dog heavy made utterly despicable for attacking him. 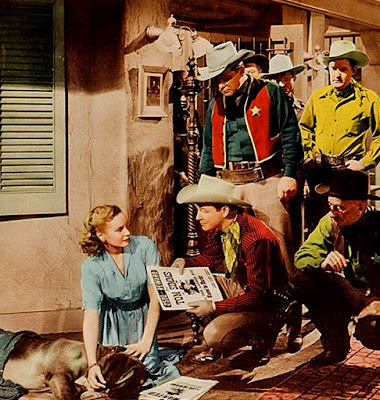 To hurt Roy Rogers, even a beating to bloody pulp (which sometimes happened to postwar Rogers) was nothing beside mistreatment of animals, a most grievous crime anyone commits in Roy-dom. Narrative will always break to heal an injured horse or dog, these expressions of humanity unique to Rogers' westerns, and I've no doubt, a reflection of his own priorities and beliefs. There's a section of Sunset In The West where a misguided, if well-intentioned, character means to kill Sherlock to relieve his suffering, Roy's race to intervene a summit of intensity. It's not giving much away to reveal that Sherlock is saved. I don't think I could have stood it otherwise. 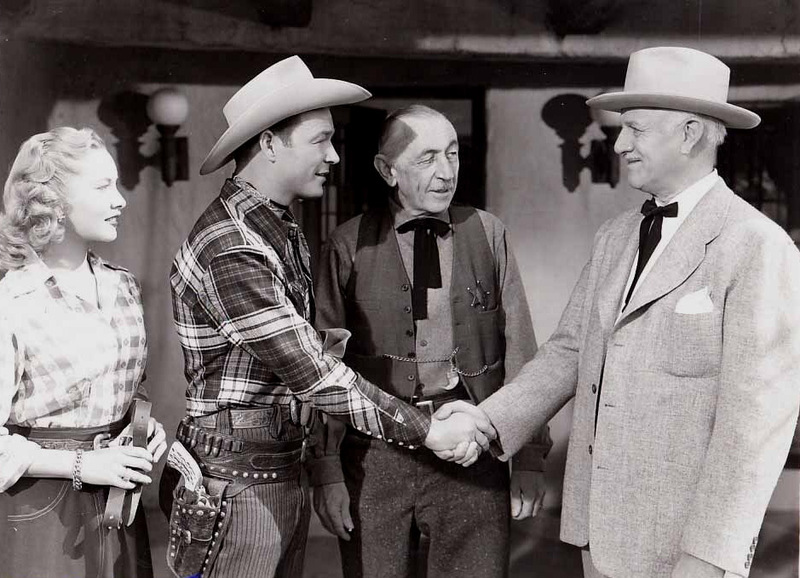 Never mind Gordon Jones' hiccups or whatever else is formula in Roy Rogers, heart and soul of him was interaction with animals, and therein lies his westerns' greatness. So yes, Saturday westerns taught good values. I've wondered if a 60's generation gap wasn't born of parents raised on cowboy teachings being confronted by offspring that were not. Nihilist westerns, fun as they seemed at the time, probably did my generation no good in the long run. Old-timers sensed that and grieved for us. They formed clubs and nostalgia meets in part to re-instill a morality they saw slipping away. Heroes like Roy Rogers stood for all that, but what could he or other of survivors do as cultural ground shifted beneath them? Nod in agreement with fans and signing another autograph was about all that was left. Roy would lend heartfelt coda to Rex Allen Jr.'s song, to which Rex Sr. also contributed. The King Of The Cowboys will play to at least tolerant degree for moderns because he's spangled and sings and is sort of campy to those who think they're hep to what ancestors liked. Also Roy lasted longer, did a lot of TV, had fast food named after him. I'd like to think Sunset In The West, if it sells, would usher in the whole of surviving Rogers, if not Republic in toto, but no, this is likelier a novelty release, a brief sup at wells where Dad and Granddad gorged. That's heaps better than nothing, though, so let's take Sunset In The West and be grateful. The Lone Pine Film Festival is still gasping along. Nothing like when it started in 1990 with B-Western guests like Peggy Stewart, Pat Buttram, Clayton Moore, and Roy himself. Later big stars like Gregory Peck, Ernest Borgnine and Jack Palance made the scene along with many of the WB TV cowboys. Now most of the celeb list consists of celeb offspring and authors hawking their B-Western books. But you can still drive a mile out of town and stand where John Wayne stood in 1930's 'The Oregon Trail' or where Roscoe Arbuckle rode in 1920's 'The Roundup'. If you stand out in the Alabama hills and toss a rock in any direction, you're bound to hit a spot where a Hoppy was filmed. As someone who grew up with Hoppy, Roy and Gene on the small screen, those early LP festivals may have been as close to heaven as I get. I was really thrilled with "Sunset in the West" on Blu-ray. This is the first time that I have seen a Trucolor Film the way it was supposed to look. As the prints for this format faded quickly, most of us have never experienced it. The Red and Blue primary colors (unlike the Red and sickly Green of old 2-Color Technicolor) really looks good. It has a magic of its own -- A great variety of blues with a deep deep blue. The lack of green is great for dusty towns and makes for a nice clean image. The 'Trucolor-look' would be a nice choice for some modern films as an artistic style. I do hope that we get a few more of these. I've never seen the real 2-Color Trucolor before. The first movie I saw was with Roy Rogers and in color. There was also a Tweety cartoon. I was 6. "Today’s mostly house-bound film buff finds little or no pleasure in the outdoor locations, and the guns make them nervous, or perhaps that is all they are interested in. Politically, both sides of the spectrum seem to deliberately miss the point of much of these oaters, in many of them, the villains are usually the ones with the most money, local robber barons setting townfolk against townfolk as they gobble away all the land, water rights, cattle, mining claims, or what have you. How many Sheriff’s clean up a town by taking away everyone’s guns within the City Limits? The message of so many westerns is actually far from the rugged individualist, the idea is more that to survive is to work together, no matter what one believes, sheep man or cattle man, in a new wilderness or frontier that is as unforgiving of mistakes as it is uncaring of one’s personal survival, all who live there must stick together. These westerns remind one that the road to civilization is to remove the gunplay, add the morals and ethics, and let the kindness and courtesy then common rule the day. Which of our polarized modern sides of thinking want to hear any of that today?" But to the specific subject at hand, I hope they look at bringing out Roy Rogers 1950 TRAIL OF ROBIN HOOD, which is not only a fun western, but is also a Christmas film, and has Jack Holt playing himself becoming a Christmas tree farmer who ends up having Roy and a slew of other western stars like Rex Allen, Allan "Rocky" Lane, Tom Tyler and Kermit Maynard help him save his trees from the Bad Guys. I believe the original Trucolor elements survive, I have a beautiful original 16mm Trucolor print of it, and it's a wonderful fun film even if the trees are more brown than green in the Trucolor limited palate. Glad to see you spotlighting the excellent new edition of "Sunset in the West". Rushed to buy it the morning it was released. As you suggested, the shabby/truncated state of so much of the Roy Rogers catalogue really rankles. Has anyone ever spelled out exactly who controlled the latterday fate of these films? Was it Republic? Some parent company? A raft of different entities? Or Roy and Dale themselves? I always sensed a dichotomy in their attitude. Justifiably proud of their films, yet seemingly okay with the way they were cut up for TV showings. Was it simply out of their hands and they were making the best of a bad situation? Perhaps they were just positive thinkers with other priorities in their lives. Whatever the case, I continue to love Roy's movies - especially the ones from '44 to '50. And it's so great to suddenly see one of his Trucolor efforts in such marvelous shape. Yes, "Sunset"'s not top-tier. Gordon Jones is a bit of a trial, Penny Edwards isn't Dale, Foy Willing's no Bob Nolan. But Roy is certainly, marvelously, reliably Roy. And the warm, welcoming vibe his best films radiated is sufficiently on display here to put the picture in the win column. Will sparkling Trucolor Blu-rays of "Twilight in the Sierras". Trail of Robin Hood" and "Under California Stars" ever materialize? Maybe not. But I keep hoping. Imshah: I think the definitive example of what you're describing is "The Lone Ranger". In his original radio and TV form he's primarily a force for law and order -- a Texas Ranger, all but officially. Law, order and united communities enable people to stand up to villains and bullies. Morality, ethics, and general decency are unofficial but strongly recommended. In both the Clayton Moore movies, bigotry and hatred (aimed at Native Americans) are emphatically tools used by criminals. The ill-starred "Legend of the Lone Ranger" and Disney's bizarre epic share what I regard as a major flaw. They go the David vs. Goliath route, pitting the masked man and faithful companion against highly organized, powerful enemies. Community and ethics work as well in those movies' worlds as they would in King John's Nottingham; like Robin Hood the Ranger has to FIGHT the imposition of order -- imposed by a hostile force, admittedly -- rather than build it by giving people faith in law and order. It's a formula that works for a lot of characters, but it runs against what the Lone Ranger really is: a solitary cop doing the work of an entire force, much of it through getting the citizenry involved. What a GREAT THRILL to see a ROY ROGERS FILM in this magnificent TRUCOLOR presentation; WHAT AN EXPERIENCE! THIS is my first go at seeing ROY & CO. on the screen like this! Roy was certainly out front for me on TV- when first experienced TV itself. The EARLY 1950'S brought instant heroes ( with DALE TOO! ), to serve out JUSTICE and reflecting a GENUINE GOODNESS that is, seriously , NOT UNDERSTOOD by most audiences of today. Yes, ROY AND HIS COMPANY- along with a few good OTHERS,- hurled to us early 'boomers' via an EARLY TV-- a healthy dose of stories CONTAINING right and wrong; -good and bad;-- and these spoon-filled lessons were added to the bewildering wonders in the minds of lives that were just beginning. And let's not forget (on his TV show),PAT BRADY and his jeep (!)"NELLIEBELLE"! And how about the INSTANT LOVE for ANIMALS exampled, and presented here, with his horse "TRIGGER", and his dog "BULLET", who helped ROY on call, when needed, in his pursuit of the 'bad guys'!. ROY ROGERS -one in a billion...and could he sing!?!! 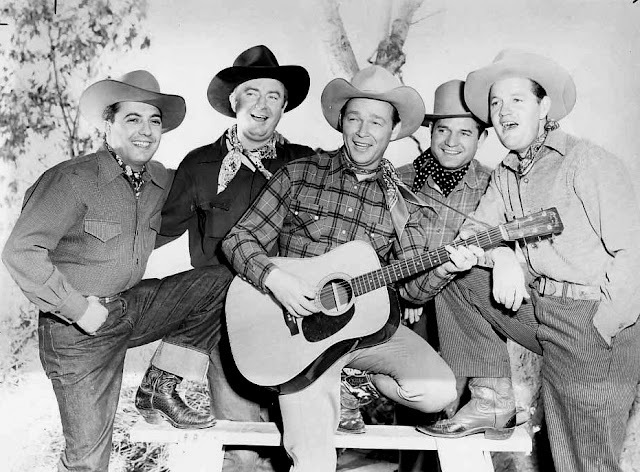 Just lend your ears to the CLASSIC RECORDING "TUMBLING TUMBLEWEEDS, with his back-up harmony group "THE SONS OF THE PIONEERS". CORNY,SOME SAY. but always a good pal he was-to me- and always he will be. thanks!